Licensed to practice Medicine in Hawaii. 1983-2010. Primary Care / Internal Medical Practice, 1983-Present, serving the underserved Leeward areas of Oahu. Clinic sees about 80 to 100 patients per day, one of the biggest private medical practices in Hawaii. Employs about 30 people including physicians, a pharmacist, physical therapist, nurses, medical assistants, physician assistants, and other paramedical personnel. Clinic sees all kinds of patients regardless of race, ethnicity, or financial capabilities. Clinic sees 2 to 3 patients FREE of charge per day. Clinic has pharmacy, physical therapy, massage therapy, laboratory and bone density measurement, ambulatory blood pressure monitoring, and 24-hour holter capabilities, among others. Co-founder – Bayanihan Clinic Without Walls, a 501-C3 organization established in 1997 to provide free healthcare to newly-arrived immigrants of all ethnicities. It has about 50 volunteers physicians and nurses, seeing about 100 patients per month. Founder and First President - University of Santo Tomas Alumni Association of Hawaii, an organization composed of U.S.T. graduates in Hawaii and involved in various volunteer activities, including bringing and sponsoring the world-renowned U.S.T. Singers. Founder and First President – Titans USA Medical Foundation – a 501-C3 organization established to render medical missions, and provide scholarships and continuing medical education here in the USA and in the Philippines. Founder – Doctors On Stage Production, a group of physicians, their assistants and friends who banded together to produce three major musical productions including “War and Peace”, “Rainbow Connection”, and “Butterflies and Kisses” shown at the Neal Blaisdell Concert Hall, and in the neighboring islands. Founder and Organizer – Philippine Medical Association of Hawaii Annual Fiesta Health Fair since 1997, one of biggest health fairs in the entire state. Owner, Publisher, and Executive Editor – Hawaii Filipino Chronicle, established in 1993 and is now the only weekly Filipino since 2005. President and Co-Founder – Oahu Healthcare Association of Hawaii, a primary care physician group based in Oahu, Hawaii. Founder – Hawaii Physicians Preceptorship Program, established to help International Medical graduates land residency positions in US hospitals. A total of 48 physicians have participated or currently being mentored by volunteer physicians. Assistant Clinical Professor of Medicine – University of Hawaii John A. Burns School of Medicine (unpaid volunteer) since 1983 to present. Lead Preceptor – Hawaii Preceptorship Program, providing free training for physicians, including free housing and boarding. Volunteer Health Training Physician and Mentor to many medical and pre-medical students, medical assistants, physician assistants, nurses and nursing students, and osteopathic students since 1983 to present. Volunteer Lecturer, various Philippine medical schools since 1983. President – Philippine Medical Association of Hawaii, 1997. Highlights of term include the founding of the Bayanihan Clinic Without Walls, PMAH Annual Fiesta Health Fair, and discussion of healthful Filipino foods with guest speaker, Dr. John McDougall and the first PMAH musical production ever. President – University of Santo Tomas Alumni Association of Hawaii, 1993. Instrumental in bringing the University of Santo Tomas Singers at the Neall Blaisdell Concert Hall for a musical concert. President – Titans USA, 2005 to 2009. An organization of Titans medical fraternity members in the United States, sponsoring free medical missions to the Philippines, participating in many charitable projects here and in the Philippines, and giving free scholarships to poor but deserving students. Member of the Board of Directors - Hawaii Medical Center, 2006-2010. Officer - Hawaii Physicians Group, a local group of 140 physicians involved in trying to save Saint Francis Hospitals from bankruptcy. Lead Organizer – U.S.T. Singers Concerts every 2 years since 2001. Lead Organizer – Ilocos Homecoming Medical Mission, every 2 years since 2001 where 10,000 to 12,000 patients are treated for free by volunteer physicians, nurses, and other health professionals. Lead Organizer – Ilocos Homecoming Chess Competitions, Ilocos Idol, Ilocos Science, Math, and Spelling Bee Contests for high school and elementary students, and other cultural activities. Director and Mission Volunteer – Aloha Medical Mission, 1997. 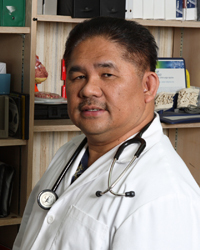 Physician Columnist – Hawaii Filipino Chronicle “Ask a Doctor”, a free question and answer medical column published in an ethnic paper providing health education. Director – Hawaii Filipino Healthcare, the only Filipino HMO in the United States. Past President - Cabugao Sons and Daughters of Hawaii, a local organization, also involved in various community projects. Simply put, internists are Doctors of Internal Medicine. Doctors for Adults. But you may see them referred to by several terms, including "internists," "general internists" and "doctors of internal medicine." But don't mistake them with "interns," who are doctors in their first year of residency training. Although internists may act as primary care physicians, they are not "family physicians," "family practitioners," or "general practitioners," whose training is not solely concentrated on adults and may include surgery, obstetrics and pediatrics. Internists can choose to focus their practice on general internal medicine, or may take additional training to "subspecialize" in one of 13 areas of internal medicine. Cardiologists, for example, are doctors of internal medicine who subspecialize in diseases of the heart. The training an internist receives to subspecialize in a particular medical area is both broad and deep. Subspecialty training (often called a "fellowship") usually requires an additional one to three years beyond the standard three year general internal medicine residency. What does "Internal medicine" mean? The term "Internal Medicine" comes from the German term Innere Medizin, a discipline popularized in Germany in the late 1800s to describe physicians who combined the science of the laboratory with the care of patients. Many early 20th century American doctors studied medicine in Germany and brought this medical field to the United States. Thus, the name "internal medicine" was adopted. Like many words adopted from other languages, it unfortunately doesn't exactly fit an American meaning.